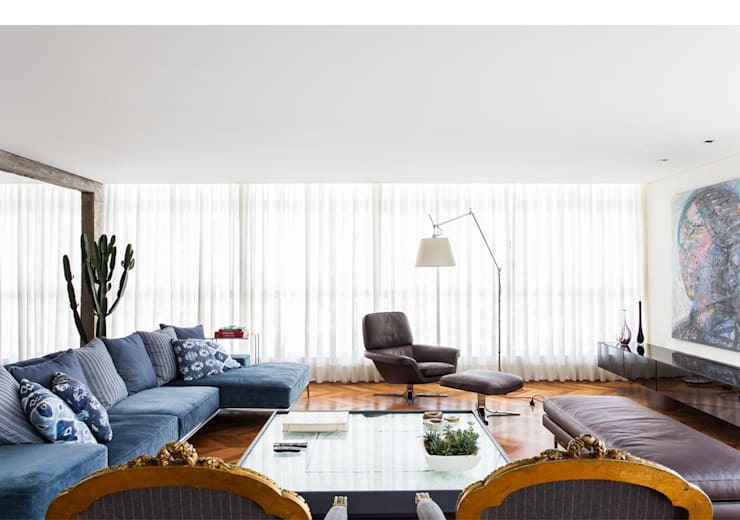 If you're a fan of chic and sophisticated interior architecture, with hints of eclecticism that straddle the classic and contemporary, then this stunning apartment, brought to us by São Paolo's RSRG Arquitetos, is going to be 255 square metres of pure bliss. 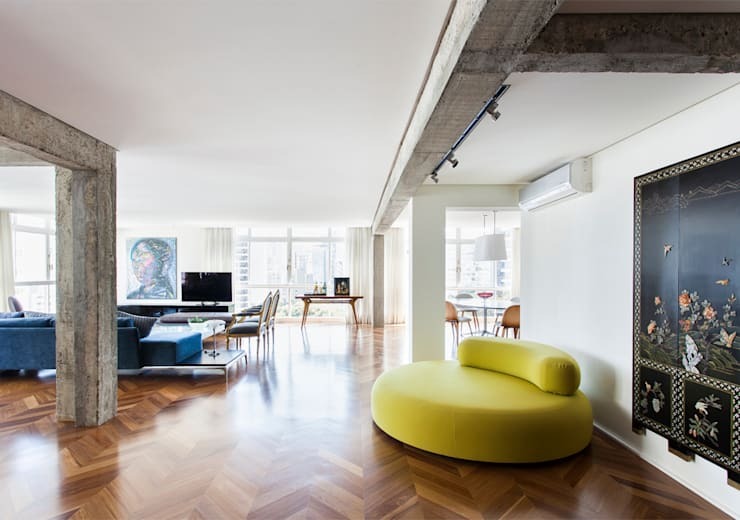 Located in Rio de Janeiro, this home showcases a stunning design, with its lofty, white walls and ceilings anchored in flowing timber and beautifully lit by sunlight streaming through a generous array of windows. From the outset this home impresses, with it's open plan living and dining rooms populated by furnishings in a range of colours, forms and styles, with the trio of contrasting finishes comprising the decor adding to the apartment's cool intrigue. 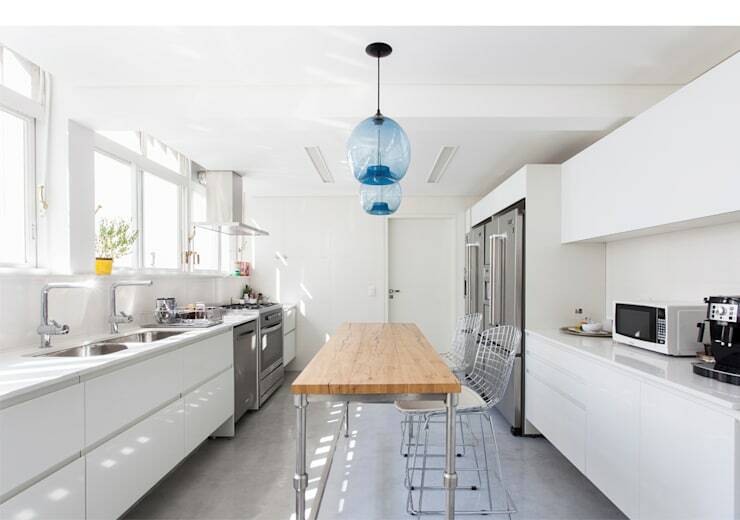 A spacious and highly functional kitchen stands really to accommodate a culinary storm, while a chic home office dressed in wood presents the perfect space to which the occupants can retire for work or play. The home's bathroom glows in pristine white, with the smoky finish of white marble infusing the room with a luxurious edge, while the master bedroom invites with the caramel tones of timber, as light flows through the rooms large windows, illuminating an array of colourful artwork. Upon entry to this stunning home we're met with a beautifully open plan decorated with an air of subtle, chic eclecticism. Light streams through floor-to-ceiling windows, illuminating an array of modern and classic furnishings, such as the contemporary, yellow couch seen here, which has been paired with a decorative wooden screen in Asian style. The decor is lofty and light, with white walls and ceilings amplifying the incoming sunlight, and the apartment's concrete beams left exposed for an industrial edge. All the while the hypnotic pattern of wooden parquetry flows underfoot, providing a subtle sense of visual expansion. The living area is spacious and inviting, with its array of comfortable furnishings bathed in soft sunlight. The cool blue of the lounge suite draws focus within the room, while a luxurious, leather reading chair rests adjacent. A bench in the same brown leather rounds out the space, providing plenty of seating for a relaxed get togther, while modern artworks adorning the walls infuse the living room with a stylish sense of character. Bordering the home's living room is this chic space for dining, with its sizeable oval table surrounded by chairs of Scandinavian design. The array of textures within this space provides a sense of intrigue, with the wooden flooring seeming to seep up the backs of the dining chairs, while the white of the walls and ceiling are capped in the cool grey of a concrete beam. 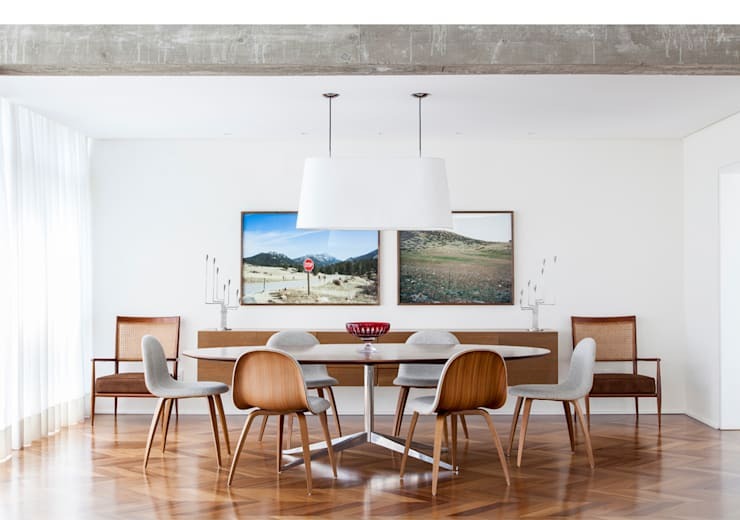 The symmetry of the wooden credenza in the distance, and its accompanying chairs and candelabras, provides a strong sense of balance within the space, while two colour photographs add character to the stark white wall behind. The kitchen in this amazing apartment benefits from a lengthy expanse, immediately creating a sense of flow upon entry. The white and stainless steel decor practically glows beneath the sunlight streaming into the room, while the long bench in the centre provides a contrast of colour and texture, as well as a place for casual dining. Ample storage has been included, as well as two large sinks, twin refrigerators and an industrial-sized stove—clearly the owners of this incredible abode are primed and ready to cook up a storm! Moving deeper into the apartment and we come across this stylish room for study and play. Dressed soley in timber, the room exudes a warm and casual air, and provides plenty of space for hobbies, study or work. 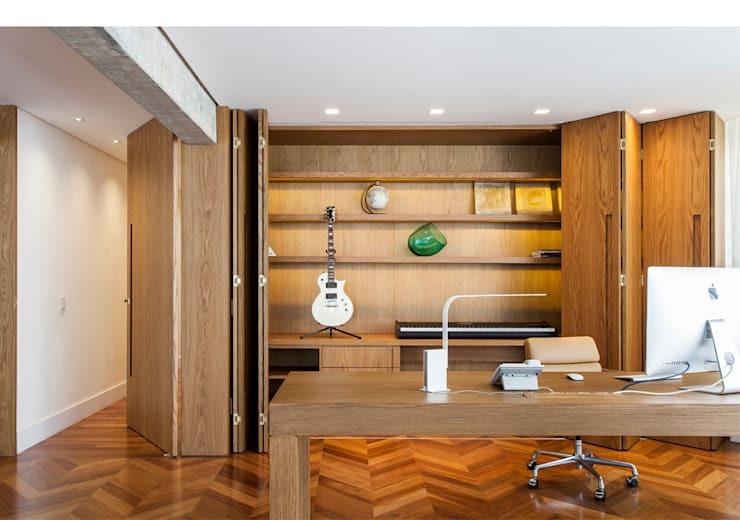 A ream of cupboards flow behind the room's simple, contemporary desk, providing plenty of space for storage or display behind their retractable doors. 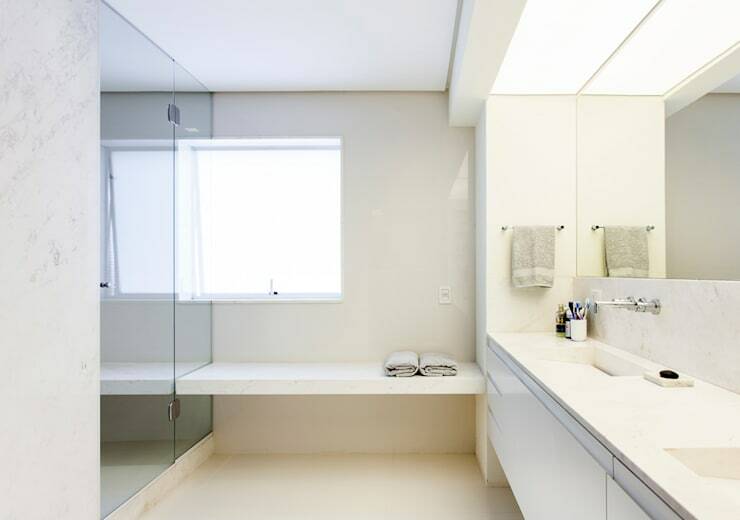 The home's bathroom glows in pristine white, with the space basking in its own soft illumination courtesy of a large window. The smoky sheen of luxurious, white marble finishes the sink, frames the shower and also constructs a simple bench, which adds to the relaxing atmosphere of the room. A large shower unit has been included in the corner, with plenty of space for the occupants to rinse and refresh. 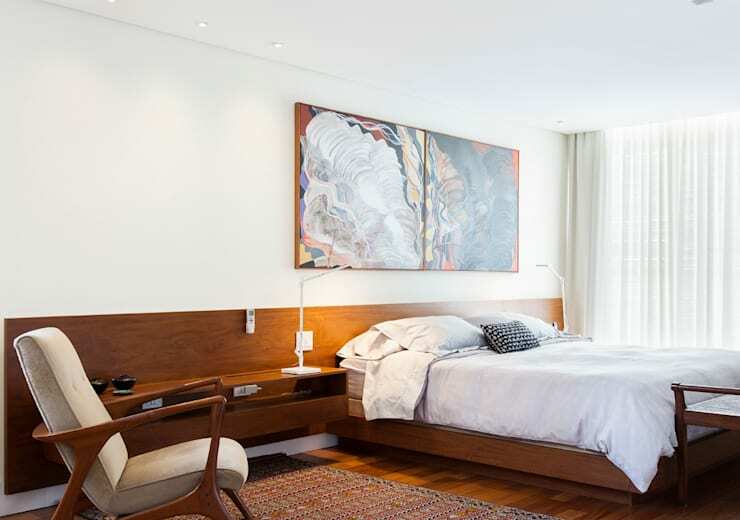 Finally, we come to the master bedroom, which emulates the same stylish, relaxed appeal as the living room. Wood and white prevail throughout the decor, while the caramel tone of the bed warms the space atop its flowing woodgrain floors. As with all the rooms in this stunning abode, light streams in through expansive windows, bouncing about the white walls and ceiling and enlivening the colourful, modern art hanging above the bed. If you enjoyed the artistic edge within this gorgeous apartment, you should also check out An Apartment of Colour and Character! Do you enjoy the subtle eclecticism in the design of this chic apartment? Tell us your thoughts below!